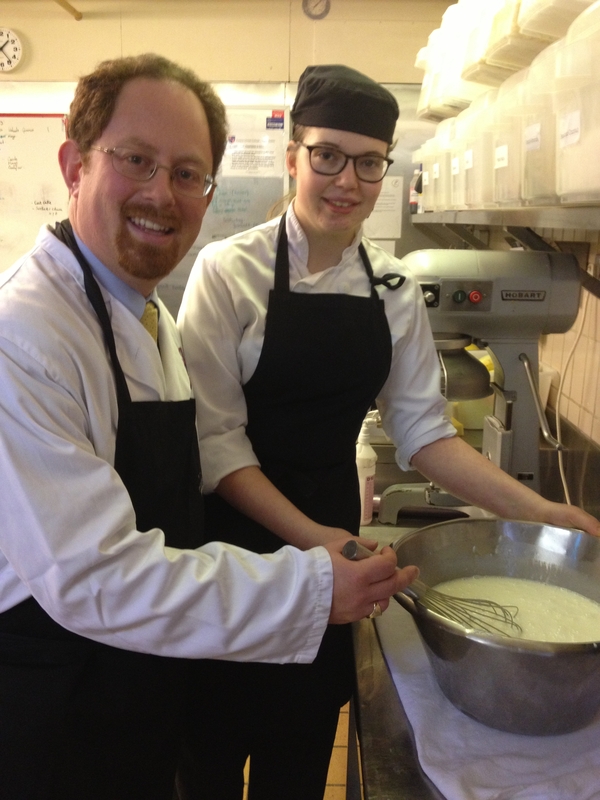 Former Cambridge Regional College student, Jo Start toldl MP Julian Huppert how her apprenticeship has all the right ingredients to help her become a top chef when she met him. Julian visited 17 year old Jo at Cambridge University’s Corpus Christi College as part of his new monthly initiative Celebrating Apprenticeships. Jo began her apprenticeship last September and helps Julian launch the initiative which is designed to recognise the excellent training schemes in the city for young people through CRC. Celebrating Apprenticeships will give Julian the chance each month to find out more about individual programmes, meet the young people learning new skills and try his hand at their jobs. He said: “Apprenticeships are a fantastic way for young people to get paid on the job training to help give them that vital first step on the job ladder. They are also good news for the employers as well because they get an opportunity to train their apprentices to meet exactly the needs of their businesses. Just weeks after starting her apprenticeship, Jo was representing the college in the University of Cambridge Chefs’ Competition where she picked up a bronze award. “I’ve always loved cooking and I’m really enjoying doing an apprenticeship,” she said. “It is a very effective way of learning and a well-structured programme – I can learn the basics at college and then put them into practice or learn different ways of doing things at work. You are learning all the time. “If I have any questions during the week, I keep a note of them and bring them up on my day at college. For instance, I needed more practice doing hot sauces to give me confidence, and I wanted to find out about going to university after my apprenticeship, so I asked my tutor. “As an apprentice, getting paid is definitely an advantage. It helps me pay for the bus to work and buy equipment. Corpus has also set me up with a pension. It is really nice knowing that I am starting to plan ahead for my future and stepping into the adult world. Jo’s ambition is to be a head chef and she hopes to go to university to study culinary art after her apprenticeship. In the meantime, she is also trying to do as much extra work experience as she can. She spent three days at River Cottage, and is hoping to follow it up with work experience at other top restaurants. Jo is currently competing to cook for CRC’s showcase apprentices’ dinner on March 4, a high profile event for the apprentices’ families and employers to mark Apprenticeship Week. She has submitted her menu and is now waiting to see if any of her dishes will be chosen for the big event. Wow, Jo seems to have learnt a lot from her apprenticeship and has been able to put it into practice. This really shows the success of apprenticeships and how they prepare you for life. Jo said herself that she has planned for the future and knows what she wants to do and how, I believe the apprenticeship has pointed her in the right direction and she seems to have received a lot of helpful advice from her college. I really believe the apprenticeship has helped her begin her career. I know she will do very well in this area, she seems to have been very successful already.